Last week, the world of soul lost one of its most prominent sisters, Aretha Franklin. The same week in August also welcomed in the debut release from a band fronted by a woman who may step in and nab the moniker of ‘Queen of Soul’ one day. Doncaster may be a long way from Detroit, but Bang Bang Romeo are also not your average rock band. The strong songs on their ‘Shame on You’ EP demonstrate the powerful vocals of Anastasia Walker and booming instrumentation by Ross Cameron and Richard Gartland, albeit presented with a Los Angeles sheen. The record starts (sorry in advance for the pun) with a bang with the title track. ‘Shame on You’ benefits from Walker’s forceful delivery and the track’s emphatic percussive beats. Are lust and desire good or bad? How about wanting things we can’t have? From the mental confusion of ‘better the devil you know than the devil you don’t’ (I think) when it comes to love and lust, we move swiftly on to the driving ‘Cemetery’. As if to prove their chops, Bang Bang Romeo slow things down immediately after with ‘Adore Me’. Walker’s soaring vocals make this tune a winner; dripping with its stated “bittersweet” emotions, she repeatedly asks, “do you adore me?” This is their stadium moment: the song builds towards a commanding crescendo, Walker holding court comfortably with her voice at its figurative peak. On ‘Bag of Bones’, Walker confronts self-esteem and body images: “I’ve got a wicked soul / still my heart can bleed / I’m so much more / I’ve got a bag of bones”. It’s an anthem not just for young girls but for all of us, a stern, arse-kicking reminder that we’re more than the skin we find ourselves in. The collection ends on a blistering note, with another stadium-sized track ‘Chemical’. Previously released as their debut single last year, it bears the line “it’s much more when it comes, like a hurricane gunning for war”. The song caps off an exemplary set of songs; like a series of fireworks, the ‘Shame on You’ EP writes high in the sky of Bang Bang Romeo’s ascending potential. The ‘Shame on You’ EP from Bang Bang Romeo is out now from Eleven Seven Label Group. The video below is a year old, but it proves that even before American A&R bods got a hold of them, they had loads of talent. Manchester singer/songwriter Katie Ware, perhaps better known by the name Little Sparrow, has recently released a new and distinctively charming EP to whet her audience’s appetite for a forthcoming full album. The EP release, simply titled ‘Just 3’, is brief but emotionally evocative, showcasing the beautiful singing voice that gave Little Sparrow her name, as well as the classically-influenced instrumental arrangements borne of her continued collaboration with producer Jonny Lexus, pianist/composer Robin Dewhurst and cellist Sarah Dale. Ware is currently in the process of writing and recording a new album, which she hopes to release in 2019. But an opportunity presented to her back in 2016 set her path on a slight detour, which has turned out to be more of a happy accident than a deterrent to her progress. The ‘Just 3’ EP began to take shape when organisers at the 2016 Kendal Calling festival suggested that Ware, who was performing at the festival, might team up with Dewhurst and Dale to work on a classic rock cover. That collaboration grew from working on the cover to writing and arranging two additional Little Sparrow songs as well, and judging from the result, the three musicians have found a successful synchronicity. In the EP’s opening track, Little Sparrow presents the fruit of the original collaboration, a drastic reinterpretation of Madness’ 1980 hit ‘Baggy Trousers’. In the hands of Ware and company, ‘Baggy Trousers’ is transformed from a zany punk anthem to a musical theatre-style vignette of melancholy introspection. Ware’s vocals find the sweet spot between sultry pop expressivity and beautiful classical technique, while Dewhurst’s delicate piano and Dale’s yearning cello provide an evocative backdrop to Little Sparrow’s remarkable reimagining of this song. The middle track on the ‘Just 3’ EP is one we’ve heard before at TGTF, early single ‘Tender’, which was released on its own back in December of last year. As we mentioned in our review of the single, ‘Tender’ is a heartfelt and very personal song for Ware, and her video treatment, which includes fan-submitted photographs of loved ones alongside Ware’s own shared images, is equally emotional. The sentimental quality of the song makes it a nice pairing with the Little Sparrow version of ‘Baggy Trousers’, continuing both its nostalgic mood and its graceful musicality. As if on cue, ‘Just 3’ closes with an unapologetic tearjerker, the aptly positioned ‘Dry Your Eyes’. In the EP’s press release, Ware relates that she wrote this song several years ago, when she was in the midst of suffering from a bout of depression. However, she emphasises that “the song is intended to be positive and to encourage the listener to ‘dry your eyes’ and to know that ‘you are not alone’.” Her uplifting message is inspiring both to the heart and to the minds of her hopeful listeners, who upon hearing these three tracks will no doubt be more eager than ever to hear Little Sparrow’s next collection of elegant and carefully-crafted songs. Little Sparrow’s self-released ‘Just 3’ EP is available now. You can find TGTF’s past coverage of Little Sparrow, including a review of her debut LP ‘Wishing Tree’, through this link. Northern Irish alt-rocker Jealous of the Birds (aka Naomi Hamilton) has recently released a new EP with an elusive but thought-provoking title, ‘The Moths of What I Want Will Eat Me in My Sleep.’ While the title might seem a little unwieldy, especially for a 5-track EP, the songs contained on the new recording are a bit less intimidating, in and of themselves. 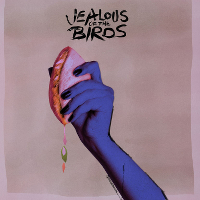 The other four songs on ‘The Moths of What I Want’ appeared on Jealous of the Birds’ debut full-length album ‘Parma Violets’, which was released in back in 2016 just after Hamilton’s first appearance at SXSW. The middle sequence of three songs, ‘Miss Misanthrope’, ‘Trouble in Bohemia’, and ‘Tonight I Feel Like Kafka’, is lifted directly from LP, with some notable production edits from the album versions. The gentle folk arrangement of ‘Miss Misanthrope’ stands in marked contrast to ‘Plastic Skeletons’ with gentle woodwind adornment and intricate vocal layering underscoring its introspective musings. Subtle yet pleasantly surprising in places, the poetry and the musical effects both leave a warm sense of empathy in their wake. The trippy folk-rock of ‘Trouble in Bohemia’ is muted and a bit grungier in its reworking for the EP, but still retains its upbeat rhythm and lo-fi production quality. ‘Tonight I Feel Like Kafka’, which we at TGTF heard in live performance at SXSW 2017, is similarly dialed back in its production, with its serpentine synth melody and Hamilton’s vocal line blended more smoothly into an overall instrumental arrangement that better suits the song’s self-consciously literary quality. EP closer ‘Russian Doll’ already had a grungy, garage rock feel in its ‘Parma Violets’ recording, which fitted the defensive mood of its lyrics. Talking about the song’s underlying meaning, Hamilton says, “It’s about when you’re in a relationship and you’re having someone else projecting certain things on you . . . and you don’t have any control over that. It’s matching up the person you want to become and what someone else sees you as.” The new EP recording, re-mixed by Ben Baptie (Young Fathers, Daughter, Lianne LaHavas, London Grammar), dials back the crunch of the guitars, emphasising instead the percussive rhythm and disjointed quality of vocal lines, giving the song a sharper edge and stronger overall profile. Though we here at TGTF have covered Jealous of the Birds quite extensively over the past few years, we missed the opportunity to review ‘Parma Violets’ on its initial release. ‘The Moths of What I Want Will Eat Me in My Sleep’ serves as a good reminder of what attracted us to Jealous of the Birds in the first place, but also gives a glimpse into where Hamilton might take her music in the future. Her alt-folk and acoustic talents having been fully displayed, she’s now taking a bolder, more rock-oriented tack, without losing the unapologetically poetic lyrical qualities that make her songs unique. If you liked ‘Parma Violets’, this new EP is simply a fresh take on some of those songs, with the added bonus of ‘Plastic Skeletons’ to whet your appetite for more new music from Jealous of the Birds. If you didn’t catch ‘Parma Violets’ the first time around, ‘The Moths of What I Want…’ is your second chance to get acquainted. ‘The Moths of What I Want Will Eat My in My Sleep’ is out now via Hand in Hive (UK) and Canvasback (U.S.). You can find TGTF’s collected coverage of Jealous of the Birds through here. These days, you have two pretty clear options on the kind of music you can listen to: true escapist fare of little intellectual consequence to take your mind away from what’s going outside your door, or songs with a conscience and enough meat on the bones to make you contemplate where you or the world has gone wrong. One is neither better than the other, but as time passes, I know which kind can console me now. Northern Irish alt-folk singer/songwriter Joshua Burnside’s latest release, the ‘All Round the Light Said’ EP, falls in the second category, and its title alone leads to some heavy questions. What is the light? Is it benevolent? Are we meant to be going towards it? While Burnside’s EP may not hold all the answers, it follows nicely from his Northern Ireland Music Prize-winning debut album ‘Ephrata’ from last year and its political and emotional content framed by South American rhythms. The EP begins with previously unveiled single ‘A Man of High Renown’, a lumbering waltz of air organ and accordion oozing Irishness. A gay and catchy melody belies the song’s dark lyrical content as the song feels like one of those films where you’re bounced between terrible events of the past and present day. At the song’s core is a struggle between the powerful and the weak. You’re left wondering if wrongs have been righted; perhaps that was the intention, to leave it as a cliffhanger? The accompanying video sees Burnside on accordion, being accompanied by dancers because, well, everyone knows the Irish are famous for their music and their dancing, right? The split screen accomplishes the same thing as the lyrics, juxtaposing locations of old and new Belfast. ‘Rearranged’ can be viewed another exercise in looking back, while also looking forward to see how far one has come or what’s up ahead. Or not. Burnside’s own technophobic tendencies have translated into a meandering guitar melody and a warbly vocal delivery. These feel like are good parallels to the noodley thoughts in your head of anxiety. ‘Northern Winds’ is a song in two acts, the first a more conventional folk song. About halfway through, a gentle drumbeat is accompanied by trumpet and banjo. The tempo speeds up and so does the overall volume as Burnside’s voice turns more insistent, referencing Oscar Wilde’s short story The Happy Prince, itself a study of compassion and sacrifice. Long a staple of Burnside’s live show and recorded in analogue, it’s interesting it immediately precedes ‘Paul’, a much more experimental number with unusual percussion, disorted organ notes and synth effects. While an obvious strength of Burnside’s is his Americana-style songwriting, the way ‘All Round the Light’ concludes suggests a future more experimental direction that would be even more intriguing. The newest release from Joshua Burnside, the Editor Mary reviews Northern Irish alt-folk singer/songwriter Joshua Burnside’s latest release, the ‘All Round the Light Said’ EP out now on Quiet Arch. EP, is out now on Quiet Arch Records. His next live appearances include UK headline shows at Glasgow Nice N Sleazy on the 10th of July and London Paper Dress Vintage on the 24th, in addition to loads of Irish appearances through the summer. A full list of his live appearances are available on his official Web site. Read through our past coverage on Burnside through this link.